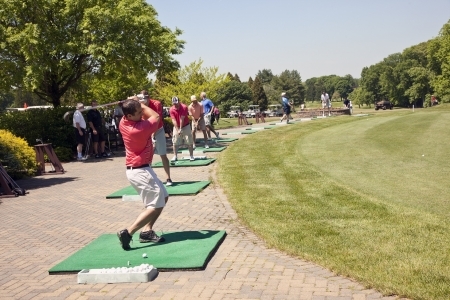 Milford, Conn. – June 30, 2014 – On June 2, more than 140 golfers gathered for Boys & Girls Village's Annual Dan & Yolanda Adley Memorial Golf Tournament, hosted at Race Brook Country Club in Orange. Supported by lead sponsors BIC, KDSA Consulting LLC, PEZ, Integrated Security Group and Brandfon Honda, 2014's tournament marked the 39th year of good sports getting together to raise money for Boys & Girls Village. While the field included many talented golfers, at the close of the tournament it was the foursome of Robert Kroepel, Paul Schatz, Brian Tubby and Ronald LoRicco who ultimately won with a score of 52.9. Other stellar performers included Jeff Matchett who won men's "closest to the line" on the 13th hole, Dawn Mortimer who won women's "closest to the line" on the 13th hole, and Scott Batz who took home the prize for "longest drive" on the 18th hole. The "Rally for the Children" Pro-Am Tennis Tournament was also held in conjunction with the golf tournament, with proceeds benefitting Boys & Girls Village. Francesca LoRicco served as Chair of the tennis tournament. Following the tournament, over 180 golfers, tennis players and guests enjoyed raffle prizes, a silent auction and dinner hosted by Emcee Mark Sudol, Sports and News Anchor at News12 Connecticut. The event was a tremendous success, raising more than $54,000 for Boys & Girls Village. "We are incredibly grateful for the generosity that our golfers, sponsors, and supporters show Boys & Girls Village year after year," said Dr. Steven Kant, President and CEO of Boys & Girls Village. "The Dan & Yolanda Adley Memorial Golf Tournament not only gives us a chance to spend a fun day together, it also brings in funds vital to supporting our work on behalf of Connecticut's most at-risk kids. We couldn't do this important work without the support of our friends." Helping children and their families gain a full life has been the goal at Boys & Girls Village for 72 years. Boys & Girls Village gives some of Connecticut's most vulnerable children and families the opportunity to heal, learn and grow. With operations in Milford and Bridgeport, Boys & Girls Village provides comprehensive care through its array of behavioral health, educational and family programs for children and adolescents at-risk. Their programs provide youth with evidence-based clinical treatment programs, a K to 10th grade school, family based in-home and outpatient treatment services, therapeutic foster care, a residential program for youth with problem sexual behavior, a live-in alternative to a hospital unit and community outreach support. Clients come from 50 different communities in Connecticut, with the majority residing in Fairfield and New Haven counties. The children and adolescents who become part of the Boys & Girls Village family range in age from 3-18 years old and are cared for by a staff of highly trained professionals including child psychiatrists, psychologists, nursing staff and a highly trained and dedicated group of paraprofessionals. Learn more at www.bgvillage.org.